Vidarbha is the eastern region of the Indian state of Maharashtra, comprising Nagpur Division and Amravati Division. Amravati division's former name is Berar (Varhad in Marathi). It occupies 31.6% of the total area and holds 21.3% of the total population of Maharashtra. It borders the state of Madhya Pradesh to the north, Chhattisgarh to the east, Telangana to the south and Marathwada and Khandesh regions of Maharashtra to the west. Situated in central India, Vidarbha has its own rich cultural and historical background distinct from rest of Maharashtra. The largest city in Vidarbha is Nagpur followed by Amravati. A majority of Vidarbhians speak Varhadi and Zadi dialects of Marathi. The Nagpur region is known for growing oranges and cotton. Vidarbha holds two-thirds of Maharashtra's mineral resources and three-quarters of its forest resources, and is a net producer of power. Vidarbha region contains Tadoba Andhari Tiger Project, Melghat Tiger Reserve, Bor Wildlife Sanctuary, Navegaon National Park And Famous Tibetan Camp in Arjuni Morgaon, Nagzira Wildlife Sanctuary and Umred Karhandla Wildlife Sanctuary. Pench Tiger Reserve is one of the premier tiger reserves of India and the only one to straddle across two states: Maharashtra and Madhya Pradesh. Throughout its history, Vidarbha has remained much calmer than the rest of India, especially during the communal troubles. However there is considerable poverty and malnutrition. It is less economically prosperous compared to the rest of Maharashtra. The living conditions of farmers in this region are poor compared to India as a whole. There have been more than 200,000 farmers' suicides in Maharashtra in a decade, of which 70% being in the 11 districts of Vidarbha region. There have been recent calls for a separate state of Vidarbha, due to perceived neglect from the Government of Maharashtra and incompetent political leadership in Vidarbha. Though rich in minerals, coal, forests and mountains, this region has mostly remained underdeveloped because of the continuous dominance of political leadership from the other parts of the state, especially Western Maharashtra. [not verified in body] Being culturally, politically and financially distinct from the rest of Maharashtra, the calls for a separate state rose to prominence only when the leaders from this region were sidelined by other political leaders in recent years. Statehood demands have not been fulfilled mainly due to the opposition from the Shiv Sena, a major state political party. Obv Linear cross with each arm terminating in pellet-in-annulet. Vidarbha was ruled by the Vakataka dynasty in the 3rd and 4th centuries BCE. It consists of two branches - The Pravarapura Nandivardhana and Vatsagulma (now called as Washim) branches. The Pravarapura Nandivardhana branch ruled from different capitals like Pravarapura (Paunar) in Wardha district and Mansar and Nandivardhan (Nagardhan) in Nagpur district. This branch used to maintain matrimonial alliances with the Guptas. The Vatsagulma branch was founded by Sarvasena, the second son of Pravarasena I after his death. Sarvasena made Vatsagulma (present-day Washim) his capital. The territory ruled by this branch was between the Sahydri Range and the Godavari River. They patronised some of the Buddhist caves at Ajanta. Prabhavatigupta was the queen and regent of the Vākāṭaka Empire. Her father was Chandragupta II of the Gupta Empire and her mother was Kuberanaga of the Naga. She married Rudrasena II of the Vākāṭaka. After his death in 385, she ruled as regent for her two young sons, Divakarasena and Damodarasena for twenty years. This region is named after the mythological Vidarbha Kingdom mentioned in the Mahabharata. Coin of King Jagadeva of the Paramaras of Vidarbha, 12th–13th centuries CE. Nagpur was the capital of the Berar Subah, known as the Gulshan-e-Berar in the Medieval period, from the rule of the Khaljis to the Mughals, according to the Ain-i-Akbari and Alamgir Namah. In 1724, when Nizam-ul-Mulk Asaf Jah declared independence, the existence of Berar as a Mughal Subah came to an end. It became (though nominally) a part of Nizam state. Then the Bhonsle dynasty of Marathas who in the mid-eighteenth century created an independent Hindu princely state that covered much of east-central India. After their defeat in the Third Anglo-Maratha War in 1818, the Bhonsle dominions were reduced to the Nagpur division. In 1853 the last Maharaja of Nagpur died without a male heir and subsequently Nagpur division was incorporated into mainstream British India. Nagpur division became a part of the British Raj's Central Provinces in 1861. Map of Central Provinces and Berar regions of British India. Nagpur is shown as capital of Central Provinces. Amravati division, formerly known as Berar division, was administered by the Nizam of Hyderabad until 1853. In that year, citing misgovernance by the Nizam, the British colonial administration took direct control over the province. Berar was added to the Central Provinces in 1903. During India's independence struggle Nagpur hosted the sessions of Indian National Congress several times. Sevagram in Wardha was arguably the capital of nationalistic India during the Gandhian era. After India's independence in 1947, Central Provinces and Berar became the Indian state of Madhya Pradesh. In 1956 Vidarbha was transferred to Bombay state along with all other Marathi-speaking areas. In 1960 Bombay State was split along linguistic lines into the states of Maharashtra and Gujarat. Marathi-speaking Vidarbha became part of the state of Maharashtra. Vidarbha lies on the northern part of the Deccan Plateau. Unlike the Western Ghats, there are no major hilly areas. The Satpura Range lies to the north of Vidarbha region in Madhya Pradesh. The Melghat area of Amravati district is on the southern offshoot of the Satpura Range. Large basaltic rock formations exists throughout Vidarbha, part of the 66-million-year-old volcanic Deccan Traps. Bhandara and Gondia district are entirely occupied by metamorphic rock and alluvium, making their geology unique in Maharashtra. Buldhana has the Lonar crater created by impact of a meteorite or comet. The eastern districts of Gondia, Bhandara, Gadchirolli and Nagpur are in earthquake zone 1, which has the least seismic activity in India, while other districts are in zone 2. Wainganga is the largest river in Vidarbha; along with its major tributaries, the Wardha, Kanhan, and Painganga, its waters flow south into the Godavari River. In the north, five small rivers—Khapra, Sipna, Gadga, Dolar and Purna—are tributaries of Tapti river. Vidarbha region has 11 districts divided into two divisions (Amravati and Nagpur). Each district has a collector's office which is responsible for day-to-day administration. The District Collector is a Central Indian Government appointee who is in charge of the governance of a district in a state. Nagpur city, the largest city in Vidarbha, has a special civic body, the Nagpur Improvement Trust, which along with Nagpur Municipal Corporation is responsible for overall development and planning activity. Other significant cities, including Amravati, Akola and Chandrapur, also have a municipal corporation. The corporators (representatives) in these civic bodies are elected. Urban areas are split into different wards and each ward elects a representative. Rural areas have a panchayat raj system. Nagpur is the largest city in Vidarbha region covering the area of 227.36 km2 (87.78 sq mi), followed by Amravati which covers 183.38km2 (71.28 sq mi) of area. Vidarbha has a total population of 23,003,179 according to the 2011 India census.Hinduism is the predominant religion, followed by Buddhism. This is unusual compared to the rest of Maharashtra and most north Indian states where Islam is the second-most-followed religion. The significant following of Buddhism is due to the Neo-Buddhist movement started by Dr. B. R. Ambedkar. Vidarbha has a rich and distinct cultural background. Though Marathi culture is most dominant, Vidarbha has been a melting pot of Telugu-speaking people from the south, Hindi-speakers from central India and tribal people of Chhattisgarh. The Gadchiroli district of Vidarbha has a large population of tribal people. Vidarbha is known for the Varhādi dialect in Amravati division and Zadipatti in Nagpur division. Vidarbha Hindi Sahitya Sammelan (for promoting Hindi). The Nagpur Central Museum (est. 1863) maintains collections that are mainly from Vidarbha. Dr. Vasudev Vishnu Mirashi (1893–1985) served as the principal of Vidarbha Mahavidyalaya, now the Government Vidarbha Institute Of Science And Humanities. The marriage of Agastya and Lopamudra. Rukmini-haran (the elopement of Rukmini with Krishna). Rukmini is described as the princess of the Vidarbha King Bhishmak and when she came to Amravati to worship goddess Ambadevi, Lord Krishna eloped with her. Later Rukmini became one of the chief queens of Krishna. Kundinpur/Kaundinyapur/Kundinapuri, the mythological capital of Vidarbha as mentioned in Mahabharata. The story of King Nala and Damayanti, also in the Mahabharata. Ramayana has the reference of Vidarbha as one on the Janapadas at that time. In Ramayana, Queen Indumatee, mother of King Dasharath and the paternal grandmother of Rama, Lakshmana, Bharat and Shatrughna, was the Princess of Vidarbha. Kalidasa's epic poem Meghaduta mentions Vidarbha as the place of banishment of the Yaksha Gandharva. The ancient 'Vijasan' hill is the site of the recent discovery of a Buddhist monastery. Vidarbha's economy is primarily agricultural, with the addition of forest and mineral wealth. From a business point of view, Gondia, Chandrapur, Akola, , Amravati and Nagpur are important cities of Vidarbha. Nagpur is a central hub for business and healthcare. Amravati is known for film distributors and cloth markets. Chandrapur has a thermal power station which is one of the biggest in India and some other heavy industries such as paper (BILT Ballarpur), steel (MEL from Steel Authority of India, etc. ), cement (UltraTech Cement, Ambuja Cements, ACC Limited, Manikgarh Cement, Murli Cement) industries and numerous coal mines. An international cargo hub project, the Multi-modal International Cargo Hub and Airport at Nagpur, (MIHAN), is being developed. MIHAN will be used for handling heavy cargo coming from South-East Asia and Middle-East Asia. The project will also include a ₹100 billion (US$1.4 billion) Special Economic Zone (SEZ) for information-technology companies. This will be India's biggest development project. The main cash crops of the region are cotton, oranges and soya beans. Nagpur is the largest orange-growing district. Traditional crops are sorghum (jowar), pearl millet (bajra) and rice. Yavatmal is the largest cotton-growing district. Gondiya is the largest rice-growing district. Gondiya is known as rice city in Vidharbha. Vidarbha has recently become infamous for a large number of farmer suicides. On 1 July 2006 the Prime Minister of India Manmohan Singh announced a ₹3,750-crore (37.5 billion rupee) relief package for Vidarbha. The package is intended to help farmers in six districts of the region. However the package was not welcomed by most financial pundits and journalist P Sainath wrote in The Hindu that the package was destined to fail. Corruption was found amongst most of the officials involved with the packages and the government considered suspended more that 400 officials in the scam. The Chandrapur, Gadchiroli, Bhandara and Nagpur Districts form the main mineral belt, with coal and manganese as the major minerals. Chandrapur district contributes 29% of all mineral output of Maharashtra. Iron ore and limestone are identified as potential mining resources. Traditionally Vidarbha has lagged behind western Maharashtra in industrial growth. Various incentives were granted to attract industries but have failed. Butibori Industrial Area MIDC outside Nagpur is one of the largest industrial areas in the country but few industries have opened there. The MIHAN cargo hub project underway at Nagpur aims to exploit the central location of Nagpur and may attract more industries. Ballarpur Industries, India's largest manufacturer and exporter of paper is located in Chandrapur district. There are many educational institutes in Vidarbha region. Most of the higher education institutes are affialiated to: Rashtrasant Tukadoji Maharaj Nagpur University, Nagpur; Sant Gadge Baba Amravati University, Amravati; Gondwana University, Gadchiroli; or Dr. Panjabrao Deshmukh Krishi Vidyapeeth, Akola. Major institutes in Vidarbha are: Maharashtra Animal and Fishery Sciences University, Nagpur; Kavikulaguru Kalidas Sanskrit University, Ramtek; Visvesvaraya National Institute of Technology, Nagpur; Laxminarayan Institute of Technology, Nagpur; Government College Of Engineering, Nagpur; Government Polytechnic, Nagpur; Indian Institute of Management, Nagpur; and AIIMS, Nagpur. Cricket is the most-popular sport in the region and Nagpur's Vidarbha Cricket Association Ground (VCA) hosted international cricket matches. It has been superseded by the Vidarbha Cricket Association Stadium, built in 2008 in Jamtha. The Vidarbha cricket team plays for the Ranji Trophy. Hanuman Vyayam Prasarak Mandal (HVPM), one of the largest sports institutes in India, is situated in Amravati.Vidharbha has been the Ranji trophy champion in 2017-18 season and 2018-19 season. Entrance of Anand Sagar, Shegaon, a holy place for Hindus and a popular picnic spot in Vidarbha. Vidarbha has lush green deciduous forests which are home to a variety of flora and fauna. These attract a large number of visitors each year. All of Maharashtra's tiger reserves are located in Vidarbha. They are Melghat Tiger Reserve in Amravati district, Tadoba-Andhari Tiger Reserve in Chandrapur district, Umred Karhandla Wildlife Sanctuary in Nagpur district and Pench Tiger Reserve in the neighbouring state of Madhya Pradesh to the north. The Nagzira wildlife sanctuary and Navegoan Bandh National Park (bird sanctuary) of Gondia District are also very popular. The eastern region of Vidarbha contains Maharashtra's oldest National Park, the Tadoba Andhari Tiger Reserve, one of India's 39 Project Tiger Reserves. The National Park consists of two forested rectangles of the Tadoba and Andhari range. Aside from around 50 tigers, Tadoba Tiger Reserve is home to rare Indian wildlife like leopards, sloth bears, gaur, wild dogs, hyenas, civet, jungle cats, and many species of Indian deer such as sambar, cheetal, nilgai, and barking deer. The Tadoba lake sustains the Marsh Crocodile, which were once common across Maharashtra. Tadoba also has a varied diversity of aquatic birdlife. Thick hills form the northern and western boundary of the Tiger Reserve. To the southwest is Irai water reservoir which acts as a buffer between the park's forest and the extensive farmland. Chikhaldara is a Hill Station and a municipal council in Amravati district. It is featured in the epic Mahabharata, where Bheema killed the villainous Keechaka, and so came to be known as Keechakadara—Chikhaldara. It is the only hill resort in the Vidarbha region, at an elevation of 1,118 metres (3,668 ft), with a number of lookout points. Wildlife include panthers, sloth bears, sambar, wild boar, and wild dogs. The nearby Melghat Tiger Project has 82 tigers. Other destinations include Gavilgad and Narnala Fort, the Pandit Nehru Botanical Gardens, the Tribal Museum, the Semadoh Lake, and the only coffee-growing plantations in Maharashtra. 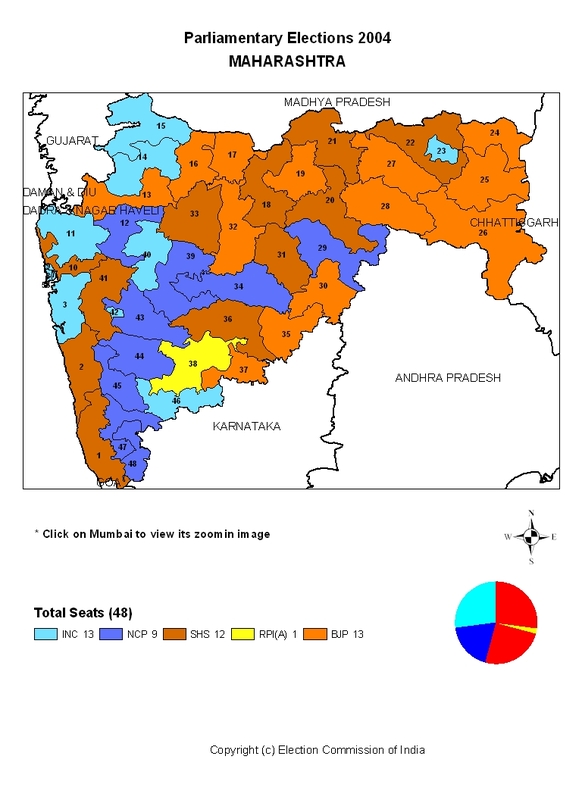 Vidarbha is represented at national level by ten Lok Sabha seats. Nagpur district which has the highest population density is split into two lok sabha seats, Nagpur and Ramtek, while districts with lower population density like Chimur and Gadchiroli are clubbed together. Ramtek and Amravati seats are reserved for Scheduled Caste candidates only while Gadchiroli-Chimur is reserved for Scheduled Tribes. Vidarbha is represented at state level by 62 Vidhan Sabha seats. Nagpur boasts the densest concentration of assembly seats with the city divided into six areas. Certain seats are reserved for Scheduled Tribe candidates only, while others are open to all. As part of the Nagpur Pact the winter session of Maharashtra assembly is held as Nagpur Vidhan Bhavan. 1853: Berar territory was taken from Nizam of Hyderabad as he was unable to pay dues of Subsidy Alliance. In 1853 "Nagpur Province" was formed with Nagpur as its capital. It was administered by a commissioner under the central government. 1861: "Central Province" was formed by the British, with Nagpur as its capital. 1903: On 1 October Berar was also placed under the administration of the commissioner of Central Provinces. It was now named "Central Province and Berar". 1935: Government of India Act, passed by British parliament, formed provincial assembly to provide for an election. Central Province and Berar was kept a separate entity, with Nagpur as its capital. 1950: When the Constitution of India went into effect in 1950, Central Province and Berar became Madhya Pradesh, with Nagpur as its capital. 1956: "Vidarbha State" with Nagpur as its capital was recommended by the States Reorganisation Commission. Instead, the area was made part of Bombay State. 1960: On 1 May Bombay State was dissolved and the "Vidarbha State" was merged with the newly formed Maharashtra State. In recent years there have been sporadic calls for Vidarbha to secede from Maharashtra. This is based on a feeling of being neglected by the Maharashtra state government and a desire to assert a distinct political identity. The region has been seen to have fallen behind others in Maharashtra in attracting investment and development funds, being comparatively poorly served by roads, irrigation facilities and educational institutions. However political movements for attaining statehood have failed to hold sway as their leaders have been considered opportunistic and corrupt. Vidarbha Rajya Party and Vidarbha Rajya Nirman Congress are very small political parties created by leaders that have split from national-level parties like Indian National Congress (INC). The only national party to officially support Vidarbha state is Bhartiya Janata Party (BJP), which included this demand in its national manifesto. Politician and economist Dr. Shrikant Jichkar opposed separation of Vidarbha from Maharashtra, believing that that it was not sustainable: "If Vidarbha is hived off, we will have no funds from day one to run the new State. The region's share is burdened by a deficit and Monopoly Cotton Purchase Scheme, Employment Guarantee Scheme and such activity will immediately cease since we would not have money to pay salaries." He noted that income from available natural resources could not balance Mumbai's subsidies, and that Mumbai's cooperation was vital to any development—in addition to the societal risks of dividing the Marathi-speaking state. ^ a b "Population". 31 March 2011. Retrieved 6 April 2011. ^ Asian Review - Google Books. Books.google.com. 1898. Retrieved 2015-05-29. ^ "Vidarbha profile on rediff". In.rediff.com. 12 October 2004. Retrieved 22 September 2010. ^ "WHO declares Melghat as India's most malnutrition-hit area". Archived from the original on 30 August 2007. ^ Sanjiv Phansalkar. "PM 2003 Schedule Irr Pov". IWMI-TATA Water Policy Research Program. Archived from the original on 18 December 2007. Retrieved 6 September 2007. ^ "Opinion / News Analysis : Maharashtra: 'graveyard of farmers'". The Hindu. Chennai, India. 14 Nov 2007. Retrieved 22 Sep 2010. ^ "Interview of Maharashtra Pradesh Congress Committee President-Mr. Ranjeet Deshmukh". Rediff.com. 18 August 2004. Retrieved 22 September 2010. ^ "Very few takers for a separate State". The Hindu. Chennai, India. 23 March 2004. Retrieved 22 September 2010. ^ "Gondia geology". Gondia.gov.in. Retrieved 22 September 2010. ^ "People And Their Culture". Gadchiroli.gov.in. Retrieved 22 September 2010. ^ "Maharashtra Airport Development Company Limited". madcindia.org. madcindia.org. Archived from the original on 10 May 2008. Retrieved 14 May 2008. ^ "Maharashtra Airport Development Company Limited" (PDF). Press Information Bureau and Ministry of Civil Aviation. Retrieved 29 January 2008. ^ "Mihan is biggest development". timesofindia.indiatimes.com. timesofindia.indiatimes.com. 22 May 2007. Retrieved 22 May 2007. ^ bhaskar deshmukh, (1 August 2006). "article". Indiatogether.org. Retrieved 22 September 2010. ^ "Demography". Chanda.nic.in. Archived from the original on 3 October 2011. Retrieved 22 September 2010. ^ "Ballarpur Industries Limited- Bilt". Chanda.nic.in. Archived from the original on 3 October 2011. Retrieved 22 September 2010. ^ "Vidarbha Cricket Association Ground profile". Cricinfo. Retrieved 12 November 2012. ^ "Vidarbha Cricket Association Stadiumprofile". Cricinfo. Retrieved 12 November 2012. ^ "Tadoba Tiger Reserve". Projecttiger.nic.in. Archived from the original on 24 February 2012. Retrieved 22 September 2010. ^ "Online Map". Projecttiger.nic.in. Archived from the original on 5 January 2011. Retrieved 22 September 2010. ^ "'Vidarbha not viable economically'". The Hindu. 2000-09-09. Retrieved 2015-05-29. Wikimedia Commons has media related to Vidarbha.